10" Rectangular Baker with Handles . This collectible stoneware baker makes a striking display – and a splendid gift. Cook and serve in this rectangular baker. 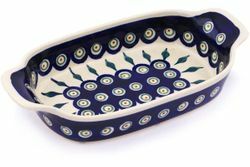 This Polish pottery baking dish moves directly and easily between the oven and table keeping your food hot and beautiful! Polish pottery stoneware comes in a variety of patterns and may be used in your oven, microwave, freezer and dishwasher. For best results avoid sharp temperature swings: cold to hot or vice versa.